I’ve been a mother for 19 years. Three times I have given birth. Three times I have taught people how to go potty, tie shoes, and trim toenails. Three times I’ve pushed a little girl behind her bike until she could do it on her own. But this year, I am the one learning. My youngest daughter Abby has become…an entrepreneur. For the past year, she’s been selling cards. And bookmarks. And posters. And bracelets. She sets up a stand on the corner of our yard and every weekend she drags out her table, lays out her creations and sells her wares. She does quite well. I’d like to take credit for her success, but I can’t. In fact, if I’m being truthful, I’d say Abby has been successful not because of me, but in spite of me. I thought I knew it all. Because for (almost) as long as I’ve been a mother, I’ve had a kiddo following me around the house, suggesting we have a sale. We could sell rocks. We could sell lemonade. We could sell art. We could sell toys. Twice I’ve been asked to have a circus. But I know how much work is involved. I know who is expected to finance the sale and how little profit will be made. I also know it takes an adult (me) to make it happen. So my answer is always the same: No. I am, a Dream Squasher. But last summer, Abby caught me off guard. She asked to sell cards. She’d already made them. I quickly surmised that this venture did not require my help, and would keep her occupied. It would also be an great economic lesson (if you make 15 cards, and sell 1 in 6 hours for 50 cents, is it worth your time?). I told her to go for it. An hour or so later, I went to check on her. I was surprised to learn she’d sold a few cards. Huh. Her customers included a teenager riding his bike, a friend from down the street, and an older couple out walking their dogs. It warmed my heart to know we had neighbors nice enough to indulge my daughter in her pursuits. And it kept her busy. Hard work + Vision= Success. Well, you can’t stop progress. Buoyed by her initial sales, Abby went into full card making mode. She made holiday cards, cards with animal photos, and funny cards like the e-cards you see online. She was a virtual card-making machine. I enjoyed seeing her pour her heart into something. Yet I also feared her customer-base would soon dry up. When summer ended, I presumed her stand would close. I was wrong. I knew my daughter was dedicated when on a cold December day she sat at her stand outside alone for two hours. As you can imagine, she made no sales. My heart ached for her. We put the table up for the winter. This year, when the warm weather returned, Abby dragged her stand back out. 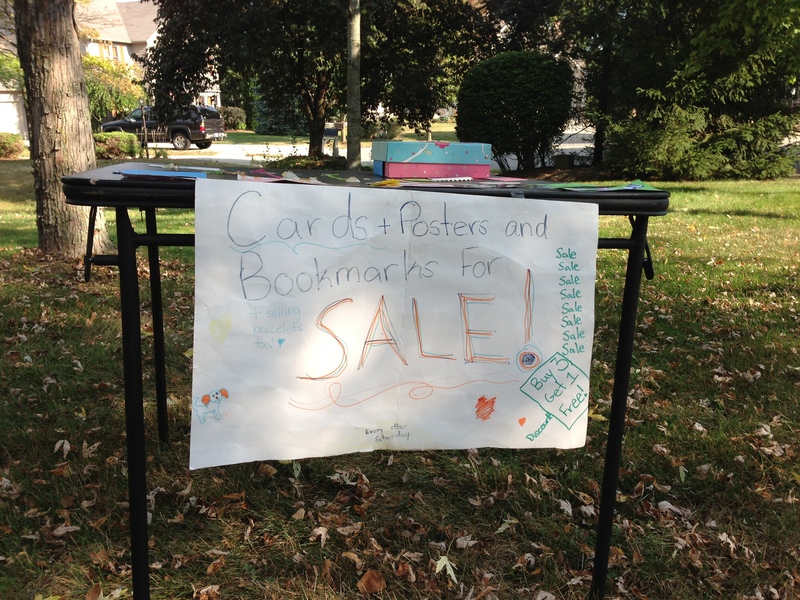 She added bookmarks, posters and bracelets to her inventory. Next we had her artwork printed on card stock and she’s selling these cards at a local store on our town square. The girl’s got game. Frankly I’m astounded by her drive. And, a bit ashamed. Lessons Learned from My Ten-Year-Old. Because not only was I wrong to think my daughter’s venture would fail, but I was wrong about it disappointing her. My hardworking girl enjoys selling her wares. She is focused, determined and best of all…having fun, despite the days when nothing sells. And so it is that my ten-year-old has taught me a few important lessons. 1-This mother doesn’t always know best. I’ve spent years “suggesting” to Abby that she play soccer, play the piano or join the Girl Scouts. I’ve been exasperated by her lack of interest in such things. When I finally let go and let her decide how to spend her time, she found her way. I probably should have let her lead all along. 2-People are good, even when there’s nothing in it for them. So many people have blessed my girl through this experience. There’s the teenager who bought three cards and let her keep the change ($5) when she didn’t have money to make change. There’s the older couple who buy cards every time they see her. There’s the local store owner who lets Abby her sell the cards in her shop without charging her a percentage. Good people, extending kindness to my daughter, with no personal gain. This makes my heart sing. 3-It takes a dreamer to achieve a dream. Great things can happen when you throw caution to the wind. Take a risk. Believe in yourself. Why would I not want to encourage my children to do this? Yes, there will be a few lonely days out in the cold. And there will always be some who do not think we will succeed (even, gasp, our mothers). But if we don’t believe in ourselves, who will believe in us? It takes a dreamer to achieve a dream. And I no longer want to be a Dream Squasher. This entry was posted in Family Life, Goals, humor, inspiration, life lessons, Uncategorized and tagged children, dreams, family, goals, humor, inspiration, kids, life lessons, motherhood. Bookmark the permalink. Thanks for supporting her. She has such fun with this! I love the card Sue sent us. Abby has real talent and is a great go getter. Your article was well written and held my interest and I think most mothers can relate to this. Thank you! Abby is such a fun kid, so different from the other two!